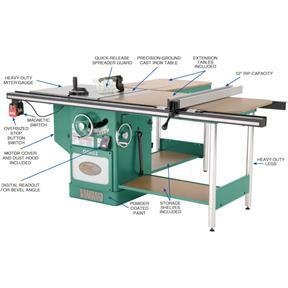 Cut panels & wide stock all day long with this 10" Heavy-duty Cabinet Table Saw. A 52" rip capacity & extended side & rear tables will support a full sheet of plywood, making ripping & cross cutting operations safe & simple. A guard with splitter or interchangeable riving knife helps prevent binding and kickback, and a rail mounted magnetic switch with thermal overload protection provides additional safety features. Bevel cutting is also safe & precise with the left tilting blade & digital angle display. 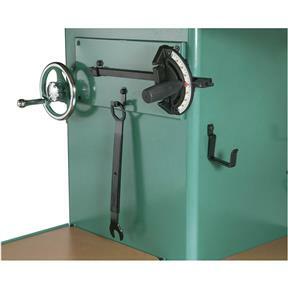 Includes a miter gauge & 10" blade. CSA certified meeting CSA C22.2 #71.2-08; CSA C22.2 #105-1953 and UL 987 standards! 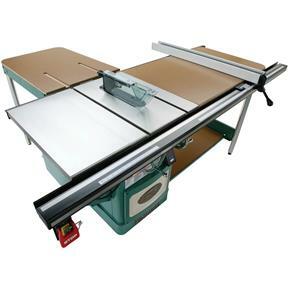 Table height from floor: 34-7/8"
Table size with extension: 27" x 75-3/4"
Maximum depth of cut @ 90°: 3-3/16"
Distance from front of table to blade at maximum cut: 10-5/16"
Distance from front of table to center of blade: 14-7/8"
Approximate shipping weight: 716 lbs. Please Note: This machine requires a 3-phase power supply. 3-phase power is usually only available in industrial settings. Otherwise normal household power or residential shops usually only supply single-phase power. Unless you are certain that you have 3-phase power, buy a machine that uses single-phase power instead. If you have any questions, please call our Tech Support at 751-546-9663. 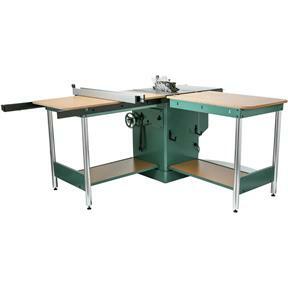 I recently purchased the G0652 5 hp 3-phase heavy duty cabinet table saw. It lived up to its reputation from all the online reviews that I read. PLEASE MAKE SURE YOU HAVE 3 PHASE POWER IN YOUR SHOP!!!! I made this mistake. Grizzly would not take it back because we were mostly done assembling it before realizing the mistake that we made. I had to go into pocket another thousand dollars to purchase a rotary converter to make it work. The product itself is great. This was my first purchase through Grizzly. So I have mixed feelings about them. I hope my next purchase is more enjoyable as I feel Grizzly products are amazing! Assembled easily, no cheap components, and is cutting composite materials like butter. Very satisfied! This is one great saw one we converted it to residential use. Grizzly worked with us as this was our error, not being "electrical" we didn't understand the term 3-Phase. 3-Phase will not work in a residential shop unless you purchased a phase converter and that can be pretty spendy. We opted to switch the motor out and made this saw a 3 HP, for home use the 3 HP works perfect. You really can place a nickle upright and make a cut without it falling...it's that smooth. If we didn't have to go through the conversion hassle we would rate this as Excellent! Again, we caution you to look into your personal electrical situation before buying the 3-Phase and we thank Grizzly for helping us through our mistake. Q: How do the G0651 and G0652 saws compare to the other Grizzly 10" cabinet saws, such as the G1023RL series or the G0690-91? 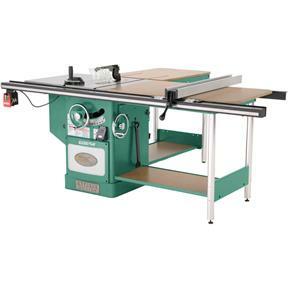 A:The G0651/G0652 are our top-of-the-line "Extreme Series" 10" cabinet saws. They are made in Taiwan under strict quality-control standards to ensure premium fit-and-finish, smooth functionality of all moving parts, and an industrial-grade level of durability and accuracy. 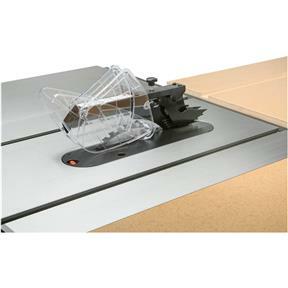 Other, more obvious features that make these saws unique are the included rear extension table, extension-table storage shelves, and a digital readout for the angle of blade tilt. 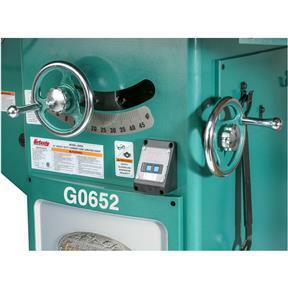 Like the G1023RL series saws, the G0651-52 table saws are equipped with the same type of padlock compatible "lock out" mag switch, a poly-V belt drive system for smoother, quieter power transfer, and the underside of the blade is encapsulated with a dust hood for improved dust collection and reduced maintenance/cleaning inside the cabinet. 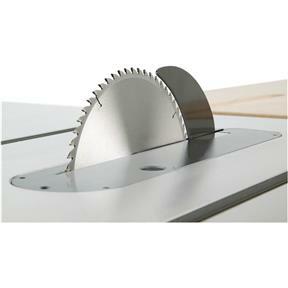 Additionally, the fence system included with the G0651-52 saws is similar in function and design to the Shop Fox Classic Fence included with the G1023RL-series models, except it has aluminum fence faces and scale indicators that read on both sides of the fence, allowing easy fence use on either side of the blade. Q: What is the difference between G0651 and G0652? A:The G0651 has a 3 HP motor and is wired for a single-phase, 220V, 15A power supply circuit. The G0652 has a 5 HP motor and is wired for a 3-phase, 220V, 15A power supply circuit. Aside from these differences, the two models are identical. Q: What is the difference between G0651-52 and G0605X1-06X1? A:These four machines have the same overall design, but the G0651 and G0652 are designed for a 10" blade and the G0605X1 and G0606X are designed for a 12" blade. The 12" models have a bigger cabinet, cast-iron table, arbors, trunnions, and other internal components, giving them a slightly larger overall size. With the addition of the larger blade, the 12" saws have the ability to cut workpieces up to 4" thick--whereas the 10" models have a maximum cutting depth of 3-3/16". The fence rails, fence, and extension tables are the same size on all four models, giving the 10" saws the same maximum rip capacity (to the right of the blade) as the 12" saws. That said, the larger castings, arbor spindle, motor size, and cutting depth of the 12" saws make them a better choice in an industrial setting, because the added heft and power allow them to better withstand the rigors that a busy production shop can demand day-in and day-out. A:Yes, however, the mounting holes on the H7507 don't line up to those on the saw, thus, requiring you to drill your own set of mounting holes in order to make it fit properly. 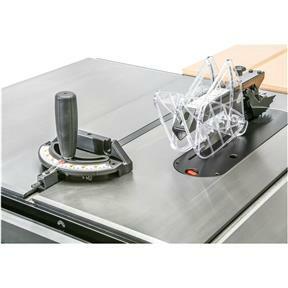 If you're okay with doing this type of work to make it fit, we recommend getting the T10222 Router Table Extension, instead. Although it costs a little bit more money, the T10222 includes its own independent fence system, a starting pin, four miter slots, and an auxiliary support leg for increased stability.